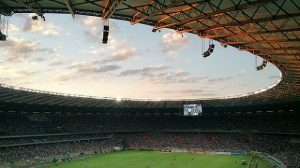 What is the UEFA Nations League and Who Should I Back This Week? While international managers may have loved the sometimes lengthy spell of friendly games that they played, giving them the opportunity to try out new players, new tactics and formations without the worry of World Cup or other qualification points being up for grabs, for the football fan, friendly games with little meaning were something of a drag. In order to reduce the number of these games, UEFA came up with a proposal for a new international tournament for its 55-member countries. 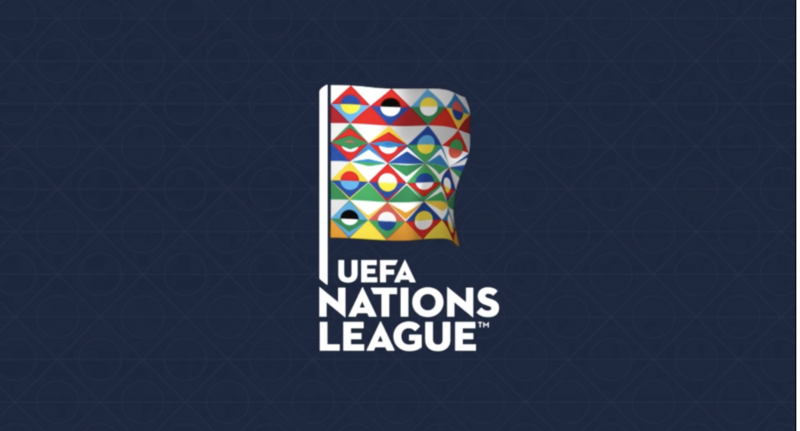 This was the UEFA Nations League, a new tournament which would be played once every two years, starting in the September of every even numbered calendar year. The members of UEFA agreed to the new tournament back in 2014 and four years later, the big kick off to the newest international tournament since the Confederations Cup, is now here. The 55-member nations of UEFA were placed into one of four different Leagues, based initially on their ranking. The group games for each league will be played across six dates in the International Calendar in September, October and November. Teams in four-team groups will have a match on each of these dates, while those in three team groups, will have matches on four dates and will be able to arrange friendlies against other teams on the two free dates. After the group stage has been completed, the winning team from each Group in each League will then contest a two-legged semifinal against other Group Winners in their League in June the following year. The winners of the two semifinals will then contest a single-match Final to decide who is the winner of each League. There will be promotion and relegation between the Leagues as a result of teams’ performances in the Group Stage and Playoffs. Teams finishing bottom of the four groups in each of League A, B and C will be relegated into the League below for the next tournament. They will be replaced by the team that finishes top of the Groups in League B, C and D respectively. From here on, it will be the promotion and relegation of teams that will decide the make-up of each league every year, although for each new tournament, fresh groups within each League will be drawn. 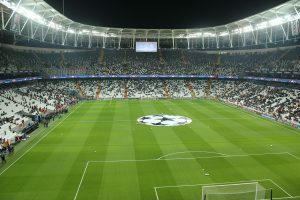 The winners of the Playoffs for Leagues A, B, C and D will earn a place at the finals of the European Championship, so the winners of these playoffs in June 2019, will earn a spot at the European Championship finals of 2020. 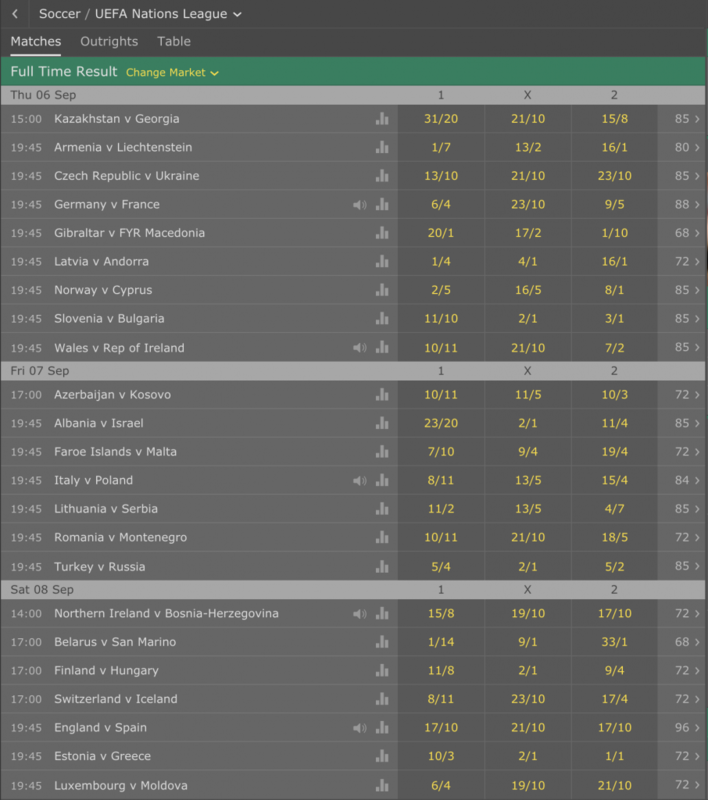 Outlined below are the latest odds on the first Matchday of games in the UEFA Nations League as provided by bet365 Sport. 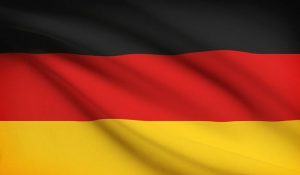 If you wanted to place an accumulator with bet365 Sport on these games, then the maximum number of selections you can have for this bet is 14, although I would guard against having more than six or seven selections in any accumulator as beyond this they become supremely difficult to hit accurately. This six-fold accumulator would pay out at odds of 274.51/1 at bet365 based on the odds above, meaning a £10 stake would return you £2754.10 in winnings, plus you would also get your £10 stake returned too. If you fancy a slightly simpler bet, then there are a couple of eyecatching games this week. This clash between the last two winners of the World Cup should be a cracker in Munich and although Germany had a poor World Cup and France won the tournament, I feel the difference between the teams is small. So much so that I would be very keen to back the draw here. My issue though is that I feel both teams have problems defensively and attacking players capable of taking advantage of that, so I would be looking to back the draw and both teams to score bet which is currently a 10/3 shot with bet365. This is a very tough opener for Gareth Southgate following on from England’s decent World Cup in the summer, Spain have a new manager and he will bring an energy and passion to the team that their performances perhaps lacked in Russia last summer. England don’t concede very many but they don’t score too many either under Gareth Southgate, even at home, so I can’t see too many goals here. I do think both teams will find the net, but I am backing Spain to be just that bit more clinical, hence Spain to win and both teams to score at 5/1 is my choice to back here.